20 Comments This post may contain paid and/or affiliate links. Please see our disclosure policy for further information. Whether you want to work-from-home and be your own boss, or you’re looking for a flexible job option that pays well, there are a lot of opportunities out there—especially if you know where to look! In fact, depending on your skills, schedule, and willingness to work away from home, there are plenty of flexible jobs that pay $19 or more per hour, which works out to $39,520 per year—the same salary you could make working a traditional 9-to-5 office job. So, if you’re tired of clocking in at the office or if you’re just looking for a way to build your household income, take a look through some of these great flexible job options that pay well. With blogging, the sky is the limit, in terms of income, flexibility, and opportunity. In fact, one of the most challenging parts of blogging is simply getting started. If you’re wondering how to set up a blog, check out our tutorial here. Once your blog is set up, you’ll want to use smart strategies to monetize, connect, and promote your blog, as well as build up your audience. There are many six-figure bloggers out there (including myself), and all it takes is a little creativity, an interest in helping others, and the ability to write or share with others online. Bookkeepers can earn up to $60 per hour, depending on your experience, area of expertise, and ability to build up your client base. Bookkeeping is different from accounting in that you don’t need an official degree certification to be a bookkeeper. If you have experience with bookkeeping or if you’re interested in getting started, there are classes available to help you learn about software, understand the basics, and even learn how to start your own bookkeeping business. With bookkeeping, you can choose to work for an online company or start your own business, each arrangement has its own sets of pros and cons, so be sure to explore this post for additional details. Copywriting is writing content, copy, and persuasive prose for clients and customers. You might write ads, web content, scripts, brochures, catalogs, social media updates, white papers, or newsletters. The options are nearly endless. If you're starting out with an ad agency, you'll likely earn between $25-35 per hour. If you’ve got a flair for writing and you’re interested in the possibility of freelance or copy work, you can check out listings on LinkedIn, Problogger, FlexJobs and DirectResponseJobs. Good freelance copywriters with proven track records can earn six, even seven figures a year. Business and career coaches can make significant money helping people figure out what they want to do with their lives and guiding them toward their goals. There's a broad range of coaching types, including career, relationship, fitness, and even life coaches. Coaches can make anywhere from $25 per hour up to $325 per hour. Career coaching requires honesty and a commitment to helping people learn how to put their best foot forward. You may help people write their resumes or hone their interview skills, or you might even help someone decide their next steps on their career path. For some coaching positions, you may need background training in dietetics, sports medicine, or psychology. Other types of coaching may require only experience and a client base. Some coaches help people overcome fears, work on their speaking skills, or master selling techniques. If you don't mind getting out and about you can earn good money (on your own schedule) by delivering food and groceries. Companies like Instacart, DoorDash, and Postmates allow you to earn $19 per hour and up. The great thing about these smartphone applications is you can get started quickly and then work whenever you have free time. I have heard that you should consider signing up with multiple companies so that you always have a steady stream of work, because, at times, there may be too many people working which means there aren't enough opportunities to go around. If you’ve ever wished you could just spend the day with your dog, or if you’re looking for an active career, consider dog walking. Wag! dog walkers make up to $25 per hour working through a smartphone app that connects them with dog owners looking for services. After a simple screening process, walkers learn how to use the app to find dog-walking opportunities right in their own neighborhoods. If you’re fond of dogs, love walking, or if you’re just looking for a fun, flexible chance to earn money while getting outdoors, this could be a fantastic opportunity for you. Uber drivers across the nation, earn an average $19.04 per hour and set their own schedules. During busy times, drivers can pick up a steady stream of riders, meet new people, and enjoy a fascinating and fun job. If you really enjoy meeting new people and love driving and navigating, Uber is a great opportunity to make money. Uber drivers must be over 21 years old and pass a background check to get started. You must be a licensed driver with your own vehicle (2001 or newer, or 2006 or newer in some cities). After the simple application process, you can start to secure driving opportunities right away! Alice's Table is a business opportunity where you host floral arranging parties at various locations. Compensation is per event, and the average event runs two hours for the arrangement, plus an additional 30-60 minutes for setup and cleanup. According to their website, if you hosted a party for 10 individuals you'd earn approximately $455 for four hours of work — which averages out to $113 per hour! If you'd like to find out more about this business opportunity, click here and fill out their Event Host Application and say that you saw them on The Work at Home Woman. 9. Freelance and Contract Work. If you have two years of experience or more in a variety of industries, you might be able to find a full-time or flexible contracting position through one of the varieties of professional companies that SpareHire works with. Positions pay up to $100 per hour with signing bonuses and other perks available. Just upload your resume and fill out the application. From there, you can browse the positions available, and if anything sparks your interest, you can send a letter with your application for the role. Then, you log your hours into their system for contract work and start making a significant amount of money. Many of their roles are flexible, and 80 percent of the positions are work-from-home jobs. 10. Home Improvement Referral Business. Anyone who’s navigated the waters of a home improvement project understands how valuable it is to get the right contractors. From securing contractors to vetting workers, and ensuring follow-through, a home improvement referral business provides consumers with peace of mind. If you're detail oriented and enjoy doing research, starting a home improvement referral business might be perfect for you! The pay can be excellent with the right client base, and even part-time home improvement referral business owners can earn $50,000 annually, which is approximately $24 per hour. If you love jewelry, enjoy selling, and are looking for a great consultant job, you can earn $40-50 per hour selling personalized jewelry through Initial Outfitters. Following a multi-level marketing structure, Initial Outfitters is flexible with hours and offers chances for promotion, bonuses and sales recognition. 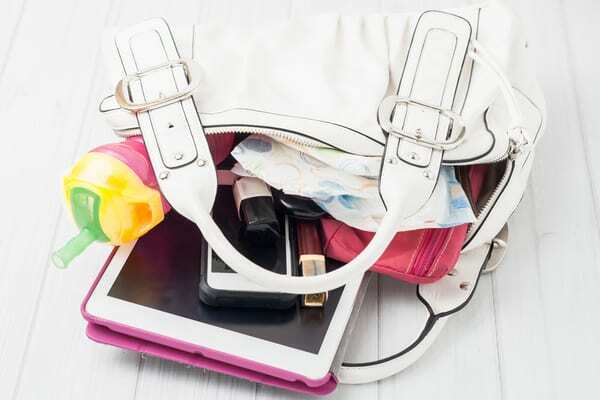 Selling popular items like jewelry from home in a “party” format gives stay-at-home moms an opportunity to earn money while doing something social and fun, in a relaxed, low-pressure setting. As you move through the process and start to build a sales team, you can earn money by sponsoring and working with other team members. If you’re strong and enjoy setting your own hours, and you don’t mind helping people move, becoming a moving assistant might be an excellent opportunity. Bellhops hires college students looking for an opportunity to make $24 per hour assisting individuals with the moving process. Students must be at least 18 years old and have their own smartphone. Dolly.com similarly pays up to $30 per hour for movers who pass a background check and either have their own truck or are willing to assist with lifting up to 75 pounds. Both businesses are great opportunities for people looking to supplement their income with some physical work and who appreciate giving people a hand to make the moving process less stressful. Ever heard of scoping? I hadn't either until a few years ago. Scoping is the process of editing transcripts for Court Reporters. A Court Reporter types the court transcript on a steno machine and uses computer-aided transcription software to translate it into English. A Scopist then reads that transcript and edits the text for accuracy. “Scopists are paid by the page, so the hourly rate is highly dependent on the Scopist’s speed, the difficulty of the material, how well the reporter wrote the job, and if s/he needs to listen to full audio with the transcript. If you'd like more information on a Scoping career, check out Linda's free intro course in the profession. Become a Stylist with the popular direct sales company, Stella & Dot. Sell beautiful accessories, jewelry, scarves, handbags and more to other women in a relaxed, in-home setting or via your own replicated website. You set your own hours and have a chance to earn anywhere from $160 per month (with 3-5 hours of work a week) up to $4,500-$90,000 per month managing your own sales team. This breaks down to roughly to $32 per hour. The company is structured in a multi-level marketing format and has an A+ with the Better Business Bureau. 15. Teach ESL Classes Online. VIPKid is an online portal where you teach Chinese speaking children the English language online. To qualify for this work-at-home job you must have one year or 500 hours of teaching experience (or the equivalent in mentoring, tutoring, or alternative education) in the US or Canada, as well as a Bachelor's Degree in any field. Teachers earn $14-22 per hour (average of $20.25 per hour). VIPKid provides training, lesson plans, and course materials, and you do NOT need to know Chinese to work as an ESL instructor. According to Payscale.com, virtual assistants can earn between $10-29 per hour working for a company. However, many virtual assistants that I have interviewed earn six figures a year (which is $48 per hour for $100K annually) by running their own VA businesses. As a virtual assistant, you can provide a wide array of services from bookkeeping to freelance work, content writing, marketing, editing, and other administrative tasks. Marketing assistants, bookkeepers, writers, graphic designers, and those who have experience with SEO, WordPress, and social media have a great deal of success with this sort of business. Over the years, I've participated in a few focal group studies. The thing I love about these opportunities is they're usually pretty fun and they pay remarkably well. Now, if you're willing to venture out and about, you can easily earn $50-150 per hour. But if you want to stay at home doing this, check out Respondent. Many of their studies are conducted via telephone or online, and according to their website, you can earn $60-140 per study (most take between 30-90 minutes). With these sorts of gigs, the opportunities are sporadic, so you won't be able to earn a full-time income, but they are good for combining with other side hustles. There’s a multitude of opportunities when it comes to flexible jobs that pay a good wage. 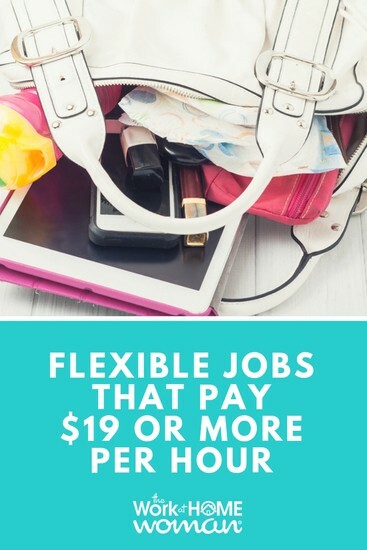 If you’re hoping to work-from-home or ready for a job or business that’s a little outside the box, try one of these flexible job opportunities that pay $19 or more per hour! Originally published on March 14, 2017. Content updated on March 12, 2019. Do these jobs allow people outside of the US to apply? I am a college student, but I’m also a substitute teacher. I’m looking for something for part time and over the summer. I’m going to school for my business administration degree. This is a great list! Everyone is looking for a side hustle it seems, and having a list of them in one place makes it much easier to find something that someone may enjoy! Glad you enjoyed the list, Matt! Which training course are you referring to? Thanks for putting this list together! It’s so good to see more work at home jobs are paying more. I remember when I started working with Cloud10 I was making $10 an hour and TeleTech was starting their reps at $9. You have some interesting jobs here, some I even like for myself. ;) Passing this on for sure. I think as more companies bring jobs home the more competitive pay will become over time (hopefully)! Thanks for the comment and spreading the social media love! I like to find information on medical coding from home. Where do I start? Hi, I am currently doing transcriptions for podcasts. Do you know where I can find similar work? I also have V.A experience 3 years. I am looking for part-time work. Thanks for the great opportunities you post! I would like to sell my short stories online, but I don’t know how.